THE new editor of the EWN Media Group has the savvy nous and sheer common sense hard won through careers in media and public relations, as well as many years as a hard-bitten policeman. 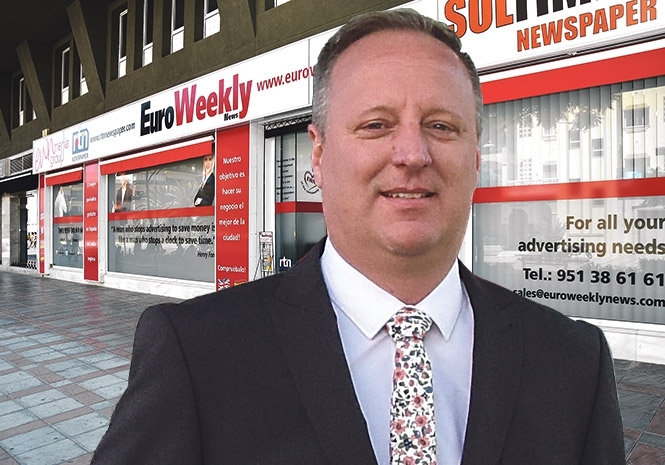 Such a wide ranging wealth of experience should serve Dean Harrison (just call him Harrison) well in his new role as hands-on editor of the six editions of the Euro Weekly News (EWN), as well as his position overseeing the three-strong RTN family of papers and the Sol Times in Almeria. Harrison, who has previously worked for the EWN as head of its digital media team, has been in Spain for five-years now and says he plans to approach the job with diligence, openness and with a team mindset. “I want to ensure we deliver the best results for all our editions and ultimately for our readers and clients,” he said. He added that he will work hard to build on the success of the company following its winning of the Spanish Press Association’s Professional Trajectory Award this year and the Best Free Publication award in 2017. “I’m conscious that the EWN has achieved great things recently and I can’t wait to take it to greater heights,” he said. “The group has gone from strength to strength under my predecessors and under the guidance of owners and publishers Steven and Michel Euesden. Let’s see how far we can take it going forward,” he said. Harrison’s background in the police gives him an attention to detail and a hunger for facts that serves him well in sniffing out the news, plus the organisational skills to put his ideas into practice. He is committed to delivering the quality combination of hard-hitting news and community and human interest stories that readers have come to associate with the EWN. “I’ve been back here for a short time to prep for my new role and I’ve already seen a wide array of well researched local stories. Our excellent team of young reporters have been interviewing residents and holidaymakers, as well as covering national news, which our loyal readers come back to us for time and again. “I’d like to take this opportunity to ask all readers of the EWN to keep getting in touch with us and letting us know about the issues that are affecting them in their local areas,” he said. Harrison has until recently spent much of his time on the Costa del Sol. Now he is looking forward to getting to know other areas popular with expatriates through his work at the EWN. “I’ve spent time in our other areas but not as much as I would like. I feel our readers want to have the opportunity to learn about what’s going on where their fellow expats are based. “Now I have the opportunity to join our readers on that and to learn more about places that I’ve not had the chance to see,” he said. Harrison believes that in today’s testing times for both Spain and the world the EWN can continue to be an informative, interesting and entertaining read for anyone interested in news and current affairs. “I would like to thank everyone in the office for welcoming me on board and having the chance to give the best to our readers. I’m looking forward to hearing everyone’s feedback on how my tenure as editor goes,” he said.